When I launched my startup almost 10 years ago, having a good domain name was already a must when launching a new business. And if you wanted to be taken seriously as an e-commerce business back then, a .com domain name was the only option. Names ending in .net, .info, or .org would not do. Wanting my company name as our domain name was a large part of why I named my new startup Zone At Home. The domain ZoneAtHome.com was available for $9.99 a year, and because I was bootstrapping my company and needed every dollar to build and market it, I wasn’t looking to pay a premium price to purchase a domain name from a third party. So when I saw the domain available on GoDaddy, I purchased immediately. I was happy with my startup’s name and even happier that I didn’t overspend on a domain name. Unfortunately, after a year in business I needed to change my name, image and branding. As I wrote in the article titled “Zone Wars: How My Startup’s First Lawsuit Was The Best Thing That Could Have Happened To It”, in early 2007 I agreed to drop the word “Zone” from our company name. This change affected many different aspects of our business: cooler bags, daily printed menus, marketing materials, business cards, signage and more. But nothing was more important than our domain name. For a company focused so heavily on tech and driving customers to purchase meals via our website, having a great domain name was crucial. Our young startup was on pace to break one million in revenue that year, and it was growing quickly by the day. I needed to come up with a great new name and a corresponding .com domain name. When I first came up with the name Fresh Diet, I felt certain that I would soon find a reason I couldn’t use it. As someone who had just been sued for trademark infringement, I was sensitive to the consequences of choosing the wrong name. The “fresh” part was pretty simple. Our competitors, like Nutrisystem and Jenny Craig, deliver their meals shelf-stable or frozen two weeks at a time. The word “fresh” highlighted the fact that we delivered our meals, every day. Using the word “diet” initially gave me pause, since we had found that many of our clients were using our meals for lifestyle rather than dieting purposes. Because shopping, preparing, and cooking healthy meals is time-consuming and difficult, many of our customers were having our meals delivered to make it easier to eat healthy. 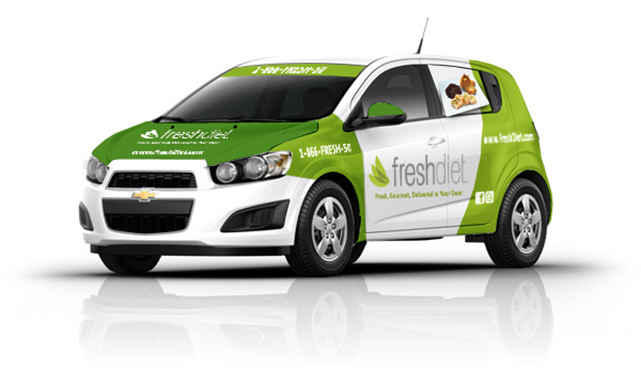 Ultimately, I decided to look at it this way: our goal at Fresh Diet is to help our customers eat a fresh, healthy diet. After choosing a name I liked and a brand I believed I could build, I needed to verify that we could use the name with no issues. Research on the trademark databases told me that the name didn’t infringe on anyone’s rights, so the next step was to check that www.freshdiet.com was available. It was not; the address led to a generic landing page announcing that the domain was for sale. Not wanting to wait, I then tried www.TheFreshDiet.com. That name was available for $9.99, and I purchased immediately. Our new brand, The Fresh Diet was born, and the new brand quickly got great feedback from both customers and associates in the segment. Although I was happy with our new name and web address, I still felt that not owning FreshDiet.com would put our brand at a disadvantage as we grew, so, within a few weeks of our re-brand launch, I contacted a representative of FreshDiet.com who quoted me $20,000 for the domain. Although I wanted the domain name, I couldn’t justify spending such a large amount of our limited capital. Our cash flow was being used to fuel growth and expand our brand and I was still bootstrapping the business. The most I would have paid was $5,000 and that would have been after a lengthy fight with my partners. I put the domain issue aside in order to focus on building my business. By 2012 The Fresh Diet had gone from a small local brand to a brand competing with the big boys of the “diet” world. Media appearances in large national stories, hyper revenue, and customer growth had propelled us into the national spotlight. But our continued growth fueled my concerns that not owning FreshDiet.com would become a liability over time. When The Fresh Diet grew to the size of a Nutrisystem or Weight Watchers, did I want the owner of the FreshDiet.com domain to push traffic to my competitors or, even worse, to launch a brand under my trademark by claiming earlier use with the purchase of the domain name? Once again, I contacted the owner of FreshDiet.com, and found a seasoned domain owner with thousands upon thousands of domain names and a pretty large business. The price was now in the low six figures. I caught my breath and tried to explain that although our brand might seem like a hundred million dollar business it was not—yet. As I continued to talk about tight cash flow and my quest to make the world a healthier place, the domain owner told me the best he could do was $75,000. That number was closer to my reality, but it was still a check I would have a tough time writing. Out of desperation I asked: can I make payments? The answer: of course, most of our deals are rentals with the option to buy. As I began to get excited about finally owning the domain, I realized the huge mistake I had made years back. Had I inquired about making payments when the asking price was $20,000, I could have had the domain for a few hundred dollars a month, a sum I would have gladly paid. Instead, I paid over $50,000 more for the same domain. The main lesson I learned from this mistake: as an entrepreneur, I need to think out of the box and find creative ways to get things done now. Back in 2007 when I originally wanted to purchase the domain name, I should have spent more time strategizing how I might secure the domain without writing a large check. I knew that as I grew my brand the domain would become more expensive, but I was too inexperienced to realize the importance of getting it done immediately. Putting the problem aside in the present only assured that I would have to deal with a more expensive version of it in the future.